There have been several educational policy changes in Turkey since 2002. These changes, affecting all educational institutions, have also seen an increase in the rate of school enrollment in higher education. According to this, the number of universities in Turkey has increased to a significant level. Faculties of Fine Arts have also been affected by the increase in the number of higher education institutions. The total number of these faculties have increased from 26 in 2005 to 67 in 2013; an increase of 158 %. This numerical increase of Faculties of Fine Arts, has revealed many controversies and opinions. Positive opinions point to issues relating to an increase in access possibilities and to a wider dispersion of faculties nationwide. In the relevant literature, it can be seen that such positive opinions are discussed as a quantitative concept. The other concept which causes controversy and usually contains negative opinions is the qualitative concept. One of the issues thought to pose a problem is mistakes regarding planning. Related research expresses that planning for Faculties of Fine Arts, established in and after 2005, has been inadequate and that new institutions commenced operations without the requisite physical and technical conditions being in place. The aim of this research is to determine students’ opinions about the physical conditions of Faculties of Fine Arts Departments of Painting established in and after 2005. Descriptive research methodology was used in the study. The research sample consisted of students of five Faculties of Fine Arts Departments of Painting which were established in and after 2005. A survey containing fifteen items was used to obtain data regarding physical conditions. The obtained data was analyzed using frequency (f) and percentage (%) and the results of the research are revealed. Altınkurt, L. (2005). Türkiye'de Sanat Eğitiminin Gelişimi. Dumlupınar Üniversitesi Sosyal Bilimler Dergisi, 12, 125-136. Çobanlı, Z. (1995). Sanat Eğitiminin Gelişimi ve Bu Gelişim İçinde Eskişehir Anadolu Üniversitesi Güzel Sanatlar Fakültesi Örneği. Anadolu Üniversitesi 1. Sanat Eğitimi Güzel Sanatlar Fakültesi 10.Yıl Etkinlikleri Sempozyumu. Erbay, M. (2000). Plastik Sanatlar Eğitimi’nin Gelişimi (2.bs). İstanbul: Boğaziçi Üniversitesi Yayınları. Günay, V. (1995). Güzel Sanatlar Fakültelerinde Sanatçı ve Hoca Yetiştirme Üzerine Bir Model Önerisi. Anadolu Üniversitesi 1. Sanat Eğitimi Güzel Sanatlar Fakültesi 10.Yıl Etkinlikleri Sempozyumu. Keser, S.C. (2009). Devlet Üniversiteleri Güzel Sanatlar Fakültelerinde Sanatçı Adayı Yetiştirme Sorunsalı (PhD Thesis). Ankara Üniversitesi, Ankara. Kıncal, R.Y. (2010). Bilimsel Araştırma Yöntemleri. Ankara: Nobel Yayın Dağıtım. Pehlivan, K. (2004). Sınıf Öğretmeni Adaylarının Öğretmenlik Mesleğine Yönelik Tutumları Ve Okul Tutumları Arasındaki İlişki. V. Sönmez (Ed.). 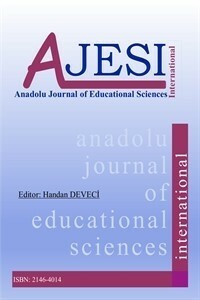 Eğitim Araştırmaları içinde. Ankara: Anı Yayıncılık. Türkdoğan, T. (2007). Yeni Kurulan Güzel Sanatlar Fakülteleri ve Yapısal Sorunları. Atatürk Üniversitesi Güzel Sanatlar Fakültesi Dergisi. Sayı:11. Yıldırım, A. ve Şimşek, H. (2006) Sosyal Bilimlerde Nitel Araştırma Yöntemleri. (6.bs.). Ankara: Seçkin Yayıncılık.